Thank you for making Radiothon a success! 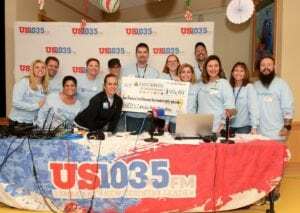 In its 10th year, the US 103.5 FM Cares for Kids Radiothon raised $406,488 for Johns Hopkins All Children’s Hospital, the regional Children’s Miracle Network Hospital. Part of what made this year’s Radiothon such a success was a generous matching donation from former Tampa Bay Lightning player, Vinny Lecavalier. A long-time supporter of Johns Hopkins All Children’s Hospital, Lecavalier pledged to match every donor dollar up to $200,000, substantially raising the total dollars raised for this year’s Radiothon. Click here to see pictures and videos from the 10th Annual Us 103.5 FM Cares for Kids Radiothon. Previous post: Tune in now & help Radiothon reach a milestone!